Do I Need A Waterproofer Or A Foundation Repair Expert? Do I Need Structural Repairs Or Basement Waterproofing? Not All Cracks Are Structural! 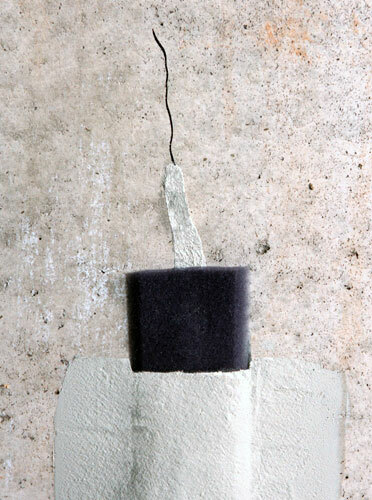 Concrete walls can form cracks during its natural curing process. 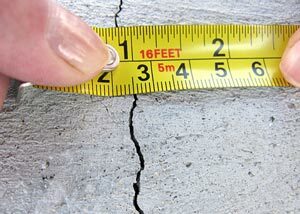 These cracks are often cosmetic issues only, and are not likely to develop into a structural issue. At Basement Systems, our experts often meet with homeowners who are deeply concerned about a large crack in their concrete foundation walls. These concerns can be well-founded, as any crack in the foundation can be an indication of a potentially serious structural issue. However, cracks appearing in concrete walls are not uncommon at all, and many of them are completely harmless. We can help you repair the harmless, non-structural cracks that are inconveniencing you by allowing groundwater penetration. Basement Systems is affiliated with the Supportworks Network -- an international network of foundation experts serving throughout Canada and the United States. Many Basement Systems Dealers are also Supportworks Dealers! Like us, they offer free quotes to homeowners throughout their service area. At Basement Systems, we have warrantied solutions for leaking basement walls that can be installed quickly in your home. We can seal cracks, leaks around pipe penetrations, and much more! To sign up for a free, no-obligation wall crack repair quote, contact us by phone or e-mail today! Your local dealer will stop by for a professional inspection of your issue. While we're there, we'll answer any questions you have about your problem, make recommendations for a solution, and work with you to create a customized cost quote that addresses all your repair needs. Is A Foundation Expert Needed? 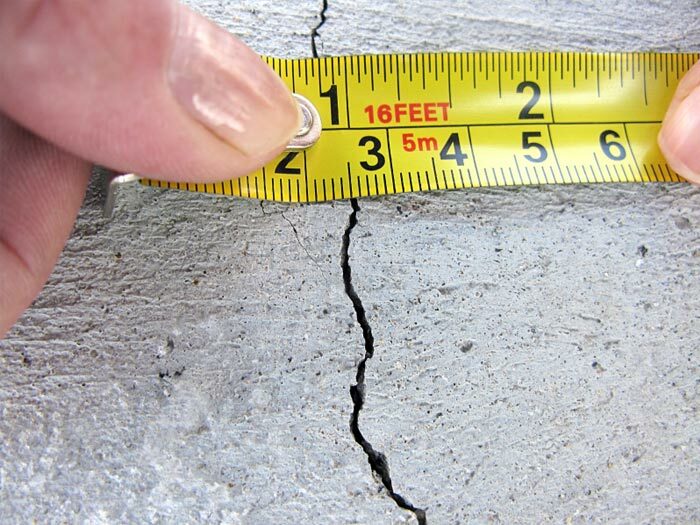 One good test to see if your crack is wide enough to merit a foundation repair inspection is the "dime test". Try to push a dime into the crack in the wall. If it fits inside the crack, then it's time to call in an expert. 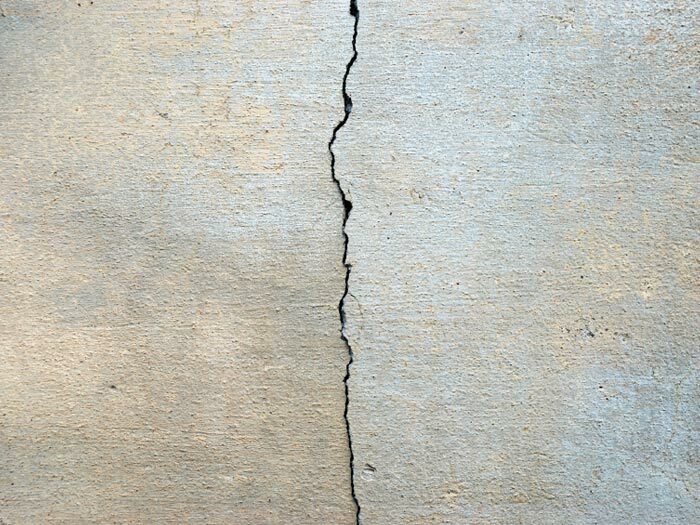 Fortunately, there are many easy ways to determine whether the crack in your foundation wall is a structural issue or a simple crack formed by the curing process of concrete. Check If The Crack Is Uneven: Settlement cracks are often uneven, as one part of the wall is pulled away more than another section. Look for cracks that are wider at the top or bottom than they are in the middle. Look For Movement In The Crack: Settlement cracks will develop and become more severe as time passes. If it does not, then it's quite possible that your crack is not an issue. Using a pencil, draw align marks on the edges of the crack, and measure the width of the crack, recording it on the wall. If the cracks widen, or the alignment mars shift, then it's likely that you may be looking at a potential structural threat. 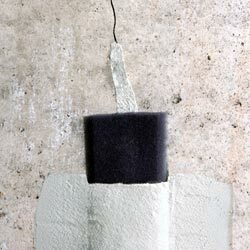 A concrete curing crack may not present a curing crack, but if it's leaking, you'll want to fix it as soon as possible. 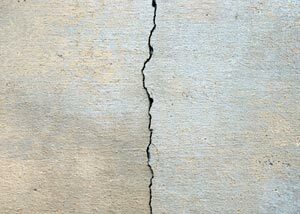 The material used to seal the crack will need to be flexible in order to hold, as concrete will swell and shrink as it is influenced by temperature and moisture. Materials such as caulk, hydraulic cements, and urethane will eventually flake and peel out of the crack due to these forces. At Basement Systems, we've developed a three-stage wall sealing process -- one that includes a polyurethane injection process, a foam drainage strip leading to a dry well, and an outer coating that gives the job a professional, tooled-off look. We Repair Leaking Foundation Wall Cracks! Whether you have a structural issue with your foundation or are experiencing leaking through an otherwise harmless crack in your foundation wall, our experts are standing by to help you! Basement Systems and Supportworks has contractors in your local area that can provide a warrantied solution for your home! It costs you nothing to meet with an expert for a professional inspection! To schedule a free, no-obligation basement repair quote with your local dealer, contact us by phone or e-mail today!